The Austin, Texas festivities, which created a toxic black cloud that was visible from as far away as Houston, were in honor of strict, newly reinforced voluntary emissions controls for Texas industries that Governor Perry said will "help make Texas the leader in weighing the health of its citizens against the need to maintain a business-friendly environment for major polluters." "TERP [the Texas Emissions Retention Plan] is a groundbreaking voluntary emissions reduction program that is guaranteed to convince the sickly citizenry that we are paying attention to this problem, while simultaneously ensuring that Texas' most prolific producers – the oil, gas, coal, petrochemical, construction and other industries – can maintain their fiscal health," Governor Perry said in a speech presented via bullhorn through a fully-enclosed, independently ventilated Plexiglas "pope-transporter". The Texas Emissions Retention Plan was passed in 2001, but the celebration was delayed until this week to allow time for 343,000 used car, truck and tractor tires to be hauled from all corners of Texas to build the bonfire. 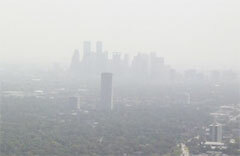 Under strict TERP air quality rules, Texas businesses can receive state grants in return for voluntarily promising to issue press releases announcing their intention to consider examining ways to look into methods of exploring means by which to build strategies for developing technologies that may reduce airborne pollutants in their industrial processes. "We're very proud of our participation in TERP," Wyatt Shardarn, chairman of Gulf Coast Alluvium, a Galveston manufacturer of petrochemical products and sludge-based effluents, said. "Since 2001 we've issued over nine press releases informing the public about our concerns on environmental and air quality issues, and if they weren't wearing those little face masks, I think you'd see the people of Galveston smiling about that." Governor Perry said TERP is intended to act as a "local mirror" of President Bush's pioneering environmental vision. "President Bush makes for darn sure he mentions voluntary industry action to protect the environment once a year during every single State of the Union speech, and that's the kind of commitment we admire down here in Texas. I think we can and should be challenged to do just as well, if not better," Governor Perry said. According to Governor Perry, Texas remains in "a solid third place position" among the bottom three of the fifty states with regard to air quality, respiratory health, and results-oriented environmental policy. With the concerted application of TERP, Governor Perry said, the future "could look even brighter". "TERP was built though a dedicated consultative process with our citizenry, using focus groups to help us narrow down priorities," Governor Perry said. "We made sure we talked to business leaders, industrial manufacturing executives, petro lobbyists, commodities traders – the works. It was hard work, but together we hammered out a policy we can be proud of—and one that won't suffocate our local industries with a lot of unnecessary government regulation."